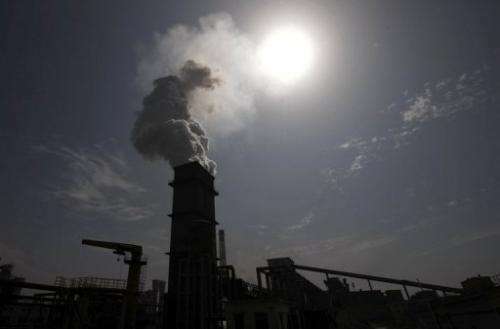 China, which eclipsed the United States several years ago to head the list, produced 9,441 megatons of CO2 equivalent (CO2e), a measure that combines C02 with other heat-trapping gases such as methane and nitrous oxide. Among advanced economies, the United States -- No. 1 among large nations for per capita emissions -- produced 6,539 megatons of CO2e. In Japan, where output was at 1,203 megatonnes of CO2e, safety fears over nuclear power could lead to a greater reliance on fossil fuels -- and a spike in carbon emissions, Laws said. Data comes from several sources, including the US Energy Information Administration and the US Environmental Protection Agency. The 194-nation negotiations in Durban, under the UN Framework Convention on Climate Change (UNFCCC), run until December 9. World population just surpassed 7 billion. So it's ~44% which is a lot closer to 50% than I expected it to be. It's also important to notice that at least a billion or so of those persons are in poverty and are not contributing as much to the problem as their more advantaged countrymen. It's nice to see you provide an in depth and useful statement today rather than railing against everyone you percieve to be on the side of the right wingnuts or anyone with more moderate views than yours frank. Im assuming these figures are based on climate alarmist modelling, rather than actual satelliate measurement. The JAXA INUKI satellite put paid to this myth a month or two ago, turns out the developing world emits most of the CO2, becuase industriralised countries have more efficient fuel sources, are regrowing forests and have huge areas of land devoted to carbon sequestering farm crops. "The method of calculation used combines 2009 figures for energy consumption with estimated numbers for 2010." Hold on, so is this about CO2 or about energy use. If its about CO2, maybe they should stop denying the satellites? we have measurements for this now, turns out alarmists were wrong again. StarGazer2011 points out some great data from the JAXA UNUKI satellite. Unfortunately for us "climate alarmist" our arguments are just junk to toss for a right-winger. Yet, even a broken clock is correct twice a day. From JAXA is this beautiful work. Climate Alarmists? Don't you mean Climate Realists? the top 10 then that percentage will start to look a lot worse. Added to that that saying "half the people produce half the greenhouse gases" sounds good - but if the total amount of greenhouse gases is, say, 5 times higher than the planet can cope with at any one time then that doesn't win us any prizes. It's worse than people think. The slope of the keeling curve is currently 2.2PPM/year, which represents the net annual gain. When the oceans and forests can no long uptake any more of what we are making due to acidification reaching physical limits, and deforestation, then the only place left for CO2 to build up will be directly in the atmosphere. Unfortunately, change isn't going to be fast. We inherited this technology and this life style, and changing to wind, solar, and other TRULY clean alternatives is going to take many years realistically, probably several decades if not longer. Sadly, history even suggests you won't be able to force people to do the right thing until no other choice is available anyway. Would be interesting to know what kind of percentage is the Alberta Oilsands project contributing to Canada's overall portion. It's kind of a double whammy... Producing greenhouse gasses to extract a substance that, when used, produces greenhouse gasses. I think it must be fairly significant if you look at Canada's population of about 34 million. I think it's more of a single whammy for them, since we in the US use the lions share of the oil produced there.